“Every drum tells a story"
The early version of the metal drums had one-piece, spun, heavy brass shells with a square center bead and heavy flanged counter-hoops. 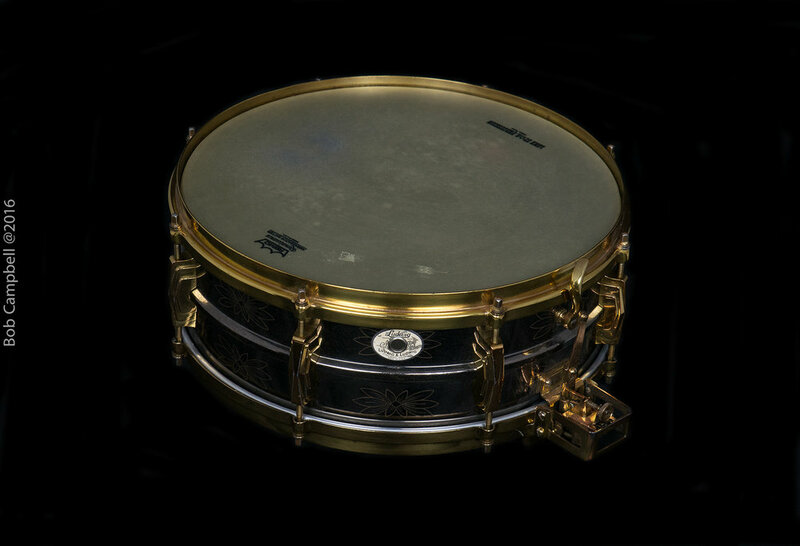 A special order 6.5 x 15” was offered in 1937 with a two-piece brass shell and round center bead. These drums had directly tapped (no inserts), brass Imperial lugs leaving them prone to stripping from excessive tension. 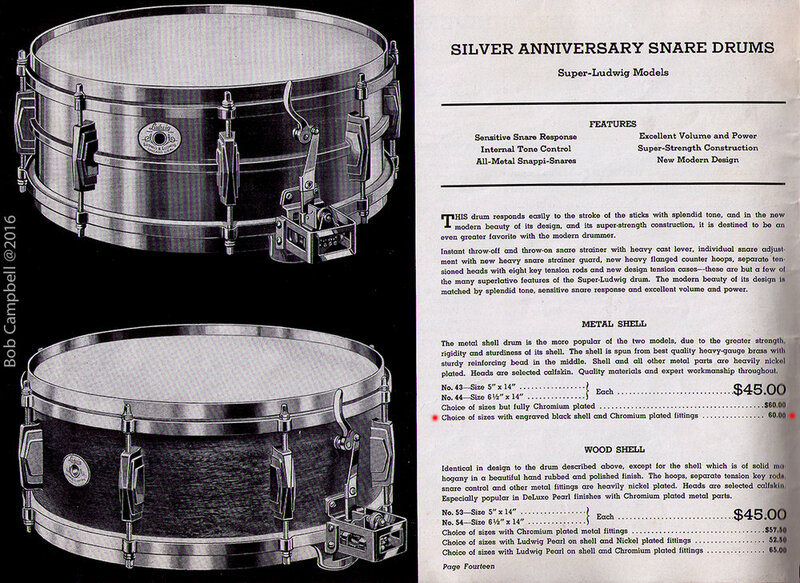 As you might guess, few of these Silver Anniversary snare drums have survived intact to date. The engraved Black Beauty versions are some of the rarest and most prized in the vintage drum community. Of these, there are only five known and are all unique. To put this into perspective, that’s fewer than the known engraved Ludwig Gold Triumphals or Slingerland Black Beauties. A couple of years ago, I acquired two Standard model Silver Anniversary brass snares, a 5 x 14” and 6.5 x 15” (http://www.notsomoderndrummer.com/not-so-modern-drummer/columns/bob-campbell-every-drum-tells-a-story/the-ludwig-silver-anniversary-standard-snare-drums). I truly fell in love with the sound of these drums, despite the quirks of their fragile lug design. I later picked up a 5 x 14” Super-Ludwig Model Silver Anniversary snare and my obsession with these drums grew. At the 2015 Chicago Drum Show, Mike Curotto showed me his latest addition to his collection, a 6.5 x 14” engraved Silver Anniversary Black Beauty he purchased from Joe Luoma (for more info, see: http://www.notsomoderndrummer.com/not-so-modern-drummer/columns/mike-curotto-medium-rare-drums/1935-36-ludwig-ludwig-silver-anniversary-black-beauty). It was a Standard Model in amazing condition with the Classic Gold finish; all I could say was, “Wow!” One day, I hoped to own one. Little did I know that my time would come only a year later. Through the collector grapevine, I found out that Joe Luoma had several of these engraved Silver Anniversary Black Beauties (!!! ), and was thinking about parting with another one. He had read my NSMD article on the Standard Model Silver Anniversary snares and knew I was clearly an aficionado. It was important to Joe that his drums go to a drummer/collector who would very much appreciate their history and take care of them for the next generation. Fortunately, Joe regarded me as one of these people. I was quite honored and humbled to be considered. So Joe and I conversed a number of times in early 2016 and eventually I became the new caretaker of a 1935-36 Ludwig Silver Anniversary engraved Black Beauty, 10-point floral pattern, 8 Imperial lugs (no inserts), Super-Ludwig Model in Classic finish. We met at the 2016 Chicago Drum Show and made the exchange during one of Jim Messina’s VintageDrumsTalk.com interviews (https://www.youtube.com/watch?v=yfBnuNI0HRw). So how far back could trace this drum back? What was its history? While I couldn’t confirm the identity of the first owner, I was able to uncover some of the drum’s unique history. 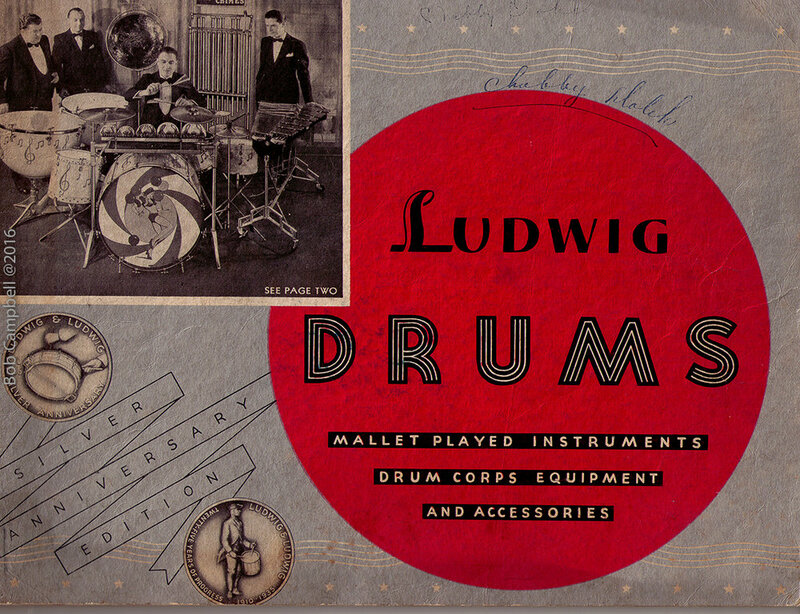 The story begins with Ben Goldberg, a drummer and collector with the modern day Ludwig Drum Company. Ben Goldberg described his discovery of the drum like this, “This drum came out of the Northwest U.S.A., where I reside, somewhere near the Washington/Oregon border sometime in the late 1990’s/early 2000’s. I was on a trip visiting a little mom-and-pop music store which is now long since gone. I was talking to the store manager and happened to look down behind the counter at his feet. I saw an Imperial lug and some kind of engraving on it, I thought. I said, ‘What’s that drum?’ He said, ‘Oh, some old lady brought it in. Let’s go talk about guitars.’ So we’re talking about guitars…but I didn’t want to talk about guitars. We walked backed to the counter. Someone’s coat is laying on this drum. Finally, I said, ‘I’d really like to see that drum.’ The manager says, ‘Well, I’ve been informed that it’s a Black Beauty.’ I said, ‘I agree with you. I think it’s a Black Beauty.’ I could not tell if it was a 70’s Black Beauty given the Imperial lugs. I really couldn’t make out the gold from a distance. I could kind of see some kind of engraving. I had never seen a 30’s Silver Anniversary before. An hour and a half goes by. I wouldn’t let him go and finally I said, ‘What do you have to have for the drum? I want the drum and I’m not leaving here without it.’ He said, ’I couldn’t take less than -----.’ I told him, ‘Give me ten minutes’ and ran to a local bank. So the proverbial little old lady actually donated this to the store. It had been in her attic for decades in logging country in the Pacific Northwest. I threw it in my car, cancelled the rest of my errands that day and called my brother, saying, ‘I found it. I got the Holy Grail.’ I held on to it for a while. It sunk in rather quickly what it indeed was on the long drive home staring at the drum in my passenger seat, and later confirmed after some limited research. This is long before any real social media or networking resources on the ‘interweb.’ I did pass it on to Bill Wanser of the Phoenix Symphony with rights to buy it back, which Bill did honor at the time of Joe’s offer. Fortunately or unfortunately, twice, this drum was too expensive for me to keep. So from one “little old lady” to a small music shop in the pacific Northwest, to Ben Goldberg, to Bill Wanser, then from Joe Luoma to me, the cycle continues. We all seek to hold a piece of drum history in our hands and pass down our knowledge to the next generation. It is indeed a privilege to own this drum and to learn its story. Many thanks to Joe Luoma, Bill Wanser, Ben Goldberg, Mike Curotto, Mark Cooper and Jim Messina (special thanks for the use of excerpts from Vintage Drums Talk) for sharing their experience, time and love of vintage drums.